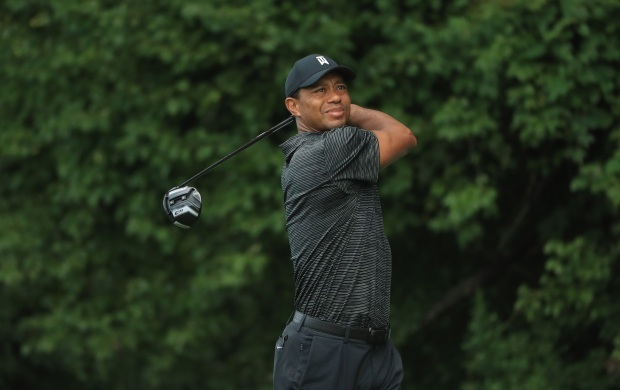 In the third round of the Dell Technologies Championship, unfortunately for Tiger Woods, a solid 3-under 68 could hardly launch him up the leaderboard. His partner today – and current FedEx Cup points leader – Bryson DeChambeau set the course on fire with an 8-under 63, leaving him within one stroke of the lead when he exited the course. DeChambeau is 12-under for the tournament, one stroke behind Abraham Ancer. The 27-year-old dual citizen of US and Mexico is at 13-under for the tournament after birdies on each of his first three holes on Sunday and six total on the front 9. Ancer has never won a PGA Tour event. Knowing the task that stands before him to win at TPC Boston for the first time since 2006, Woods pointed out how vital a quick start would be for him tomorrow. Any early signs of trouble would, for all intents and purposes, end his bid for a win in Norton. Woods and DeChambeau won’t be paired up during Monday’s final round, though it’s entirely possible they could find themselves playing together again later in September on the US Ryder Cup team. They would each have to be two of Jim Furyk’s four captain’s picks for the event, which pits the top American golfers against the top Europeans. Three of those selections will be announced on Tuesday. DeChambeau, 24, called the 42-year-old Woods his childhood idol in his post-round press conference. Acknowledging that he was a little nervous at first, DeChambeau never showed it. He scored seven birdies against one bogey on Sunday and put the exclamation point on his round with an eagle on the par 5 18th hole. DeChambeau birdied the par 4 first hole and par 5 second, setting his tone early. Woods made four birdies against one bogey on Sunday. “If he goes around and shoots 8-under par every time, that will work,” Woods said when asked if he and DeChambeau could make an intimidating pairing in the Ryder Cup. Woods didn’t say exactly what he needed to work on, but answered affirmatively when asked if he’d be spending any time at the driving range and/or putting green on Sunday afternoon. “I’m going to do a little work today,” he said. Other top performers in Norton on Sunday included Emiliano Grillo, who shot a 7-under 64 to move within three strokes of the lead. Rory McIlroy had a nice round, shooting a 5-under 66. He’s at 9-under for the tournament, three strokes off the lead. McIlroy has won at TPC Boston twice, in 2012 and 2016. Cameron Smith, Justin Rose and Tyrrell Hatton are in a three-way tie for third place at 11-under for the tournament. At 7-under, Woods is part of a crowded group that’s tied for 15th: Matt Kuchar, Peter Uihlein, Keith Mitchell, Brooks Koepka, C.T. Pan, Si Woo Kim, Adam Hadwin and J.B. Holmes. Webb Simpson, who began the day in sole possession of the lead at 11-under, tumbled all the way to 25th courtesy of a 5-over 76 on Sunday.